And with fire in his heart Sergius went to the sword. 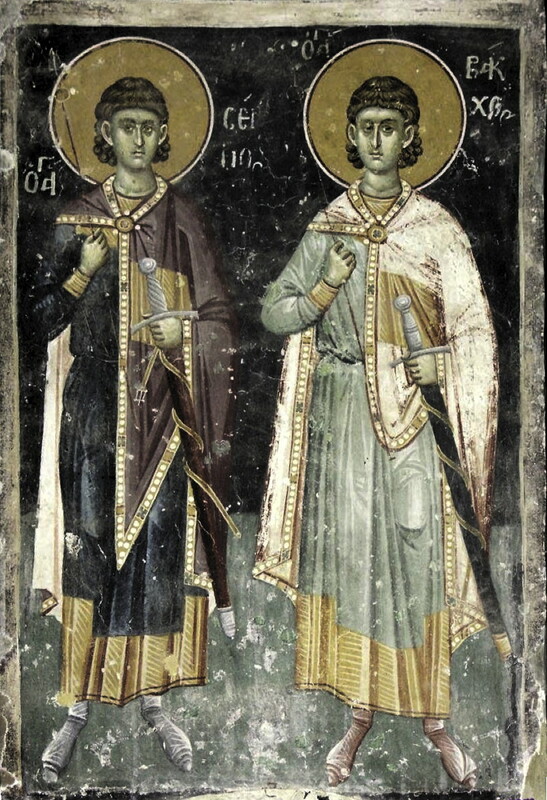 On the seventh Sergius was killed by the sword, Bacchus by sinews. 1. When the tyrant Maximianus was emperor great error had seized the race of men; for they worshipped wood and stone, the creations of man, and feasted on impure sacrificial offerings. Moreover those who were unwilling to offer sacrifice were forced by the infliction of violent punishments and penalties to serve the demons. Thus an edict containing the severest threat was publicly posted in every city. Thereupon the clean air was polluted by the diabolic stench from the altars, and the darkness of diabolic error was thought an opportunity to meet friends. Then, like earth-bound stars, Sergius and Bacchus exercised great influence in support of Christianity in the palace, and were honoured by the emperor Maximianus. Indeed blessed Sergius was the primicerius and commander of the schola gentilium, a friend of the emperor and trusted by him so much that he acceded swiftly to his requests. 2. For this reason Antiochus, a friend of Sergius, asked the emperor to make him the dux of the province of Augusto-Euphratensis; blessed Bacchus was a friend of this same man also, and he was secundicerius of the schola gentilium. They were one in the love of Christ, and were never separated from each other in their earthly military service, joined not by their natural temperament but by the chain of faith, always singing and saying, "How good and pleasant it is for brothers to live together" [Psalm 133:1]. They were, therefore, intelligent and happy soldiers of God, perfectly resolved by the divinely inspired scriptures upon the destruction of the devil's error, and they exercised themselves fully in battle for the destruction of barbarians. Seeing them to converse elegantly in the royal chambers, and to advance in the military service, and to have the emperor's confidence, some from that same schola gentilium were goaded by the envy of a cruel and evil demon. When they did not *otherwise succeed in ensnaring them in their traps they made the accusation to the emperor that they were Christians. 3. Waiting for a time when blessed Sergius and Bacchus were not present with the emperor, they found him alone and said, "Great indeed is the devotion of your immortal highness to the worship of our great and venerable gods; your instructions on this account have reached everywhere and in every place. In these you have instructed that the guilty, those unwilling to honour and worship them, should be killed by the many punishments prescribed in your fault- less edict. How is it, therefore, that Sergius and Bacchus who enjoy so much confidence in the matter of your eternity's authority, the leaders of our schola, revere Christ himself, he whom those called Jews crucified and killed as a mischief-maker, and by persuasion draw many others from the worship of the gods, and lead them to their religion ?" Hearing these things, but not believing them, the emperor said, "I do not think that you are telling the truth, because Sergius and Bacchus are not devoted to the honour and worship of God. 4. While I have an unblemished regard for them, they do not deserve to acquire this unless they are devoted and sincere; but if they are of that cult, as you allege, they shall be arrested. And calling them together, ignorant of what has been said, I shall go with them to the shrine of great Jove, and if they offer sacrifice, you will find acting in favour of such lies a cause of danger to you; but if they are unwilling to offer sacrifice, they will suffer the penalty suited to their wickedness. For the gods do not want the attendants of my empire to be impious or ungrateful." In response the accusers said to the emperor, "Moved by our love and affection for the gods, we have reported to your immortal highness that which we heard about them; it will be the task of your undiluted wisdom to detect their wickedness." Thus the emperor immediately called them together, and when they had entered with the customary obedience of attendants, taking them with him he entered [the shrine], and offered sacrifice along with his officials. He looked around at these when they were feasting upon the offerings, and he did not see blessed Sergius or blessed Bacchus. 5. For they had not entered into the temple, thinking that it was wicked and unlawful to watch people offering sacrifice and feasting on the impure offerings: they stood outside and prayed, saying as if with one voice, "O King of Kings and Lord of Lords, you who inhabit the inacessible light, enlighten the eyes of the heart of those who live in the darkness of ignorance, who have exchanged your glory, that of the incorruptible God, for the likeness of perishable men, birds, four-legged beasts and serpents, and serve the creature rather than the Creator [Romans 1:23-25]. Convert them, that they may recognise you as the only true God, and Our Lord Jesus Christ as your only-born son, who suffered death and rose for us and our salvation, to rescue us from evil and free us from the error of vain idols. Preserve us pure and unstained along the journey of witness to you, that we may be changed in accordance in with your commands." And while this prayer was still on their lips even, the emperor sent some of his aides who were standing nearby, and ordered that they be brought into the temple. 6. He said to them as they entered, "I see it this way, that trusting in my great clemency and humanity, with which protection the gods have provided you, you are willing on top of this to scorn the imperial edict as law-breakers and enemies of the gods. But I will not uphold the complaints which have made about you unless they are proven. Approaching, so, the altar of great Jove, offer sacrifice and taste the mystical offerings, just as the rest do." 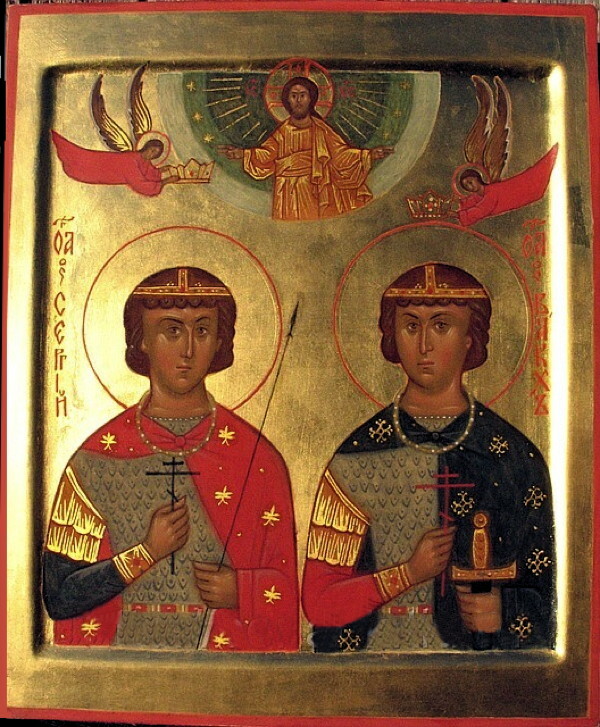 However Sergius and Bacchus, the martyrs and most brave soldiers of Christ, said in response, "We must discharge to you, O emperor, the earthly military service of our bodies; but we have a true king, Jesus Christ eternal in heaven, the Son of God, to whom we devote our souls, he who is our hope and saving refuge. We offer to him everyday a holy and living sacrifice, and reasoned worship; for we do not sacrifice to, or adore, stones and wood. Your gods have ears but they do not hear the prayer of men. They have noses likewise, but they do not smell the sacrifice which is offered to them. They have mouths but they do not talk, hands but they do not touch, and feet but they do not walk. May they and all who trust in them become like those things which they make" [Psalm 134:18]. 7. Thus the emperor was infuriated, his whole face changed, and he ordered that their military belts be immediately removed, that they be stripped of their cloaks and any other military garments, and, at the same time, that their golden collars be removed from about their necks. He dressed them in women's clothing, and he ordered that they be dragged in this way, with the heaviest chains about their necks, right through the middle of the city as far as the palace. When the holy men were being dragged through the middle of the forum they chanted together, saying, "Although we walk in the shadow of death, we shall fear no evils, since you are with us," [Psalm 24:5] and the words of the Apostle, "Denying to this extent all wickedness and earthly desire, [Titus 2:12] and having removed the clothing of the old-man, [Colossians 3:9] let us rejoice naked in our faith in you, O Lord, because you have clothed us in the garment of salvation, and you have wrapped us in the tunic of joy. You have adorned us in women's clothes, like a spouse, unite us to you through our confession [Isaiah 61:10]. You, O Lord, have put your trust in us, saying, "You will be led before kings and governors on my account, and when they hand you over [to trial] do not worry how you will sound or what you will say. You will be given what to say at that hour. For they will not be your words which you are speaking, but words from the Spirit of your Father who speaks in you" [Matthew 10: 19-20]. 8. Rise, Christ, help us, and fight off our attackers, comfort our souls, that we may not be moved, and the wicked may cry, "Where is their God?" [Psalm 118:9-10]." When they came to the palace the emperor called the saints and said, "O most wicked of all men, do you think that you can trust in the friendship which you had with me, and reply in such an unpermissible manner ? Why do you blaspheme against the gods through whom the human race enjoys great peace ? Do you not know that he whom you call Christ was the son of a carpenter, and that his mother conceived of him by an act of adultery before the marriage was legalised ? He whom the Jews also crucified because he caused disturbances and riots among them, deceiving with his magic skills and calling himself God. The most great family of our gods was conceived of the legitimate marriage of Jove. The great gods Jupiter and Saturn are mentioned with respect because of their connection with the blessed Juno. But I suppose that you have heard of the twelve great heroic labours." 9. But the most brave soldiers of Christ said in response, "You are wrong, emperor; for these are fables which deceive the ears of simple men, and lead them to perdition. He whom you say to have been the son of a carpenter by an act of adultery, he is the son of the true God, with whom and through whom he made all things, spread-out the heavens, founded the earth, restrained the abyss and the great sea unfettered by sand, adorned heaven with a multitude of stars, created the sun for lighting-up the day, and the moon for comfort during the night, separated darkness and light, and fixed the length of the day and the end of the night. He has produced everything from nothing, as he allows. For he has made all things in wisdom, just like God. Moreover in the last days he was born on earth for the salvation of man, not by the will of a man, nor by physical pleasure, but by the Holy Spirit and an ever-virgin girl. And he mingled with men, teaching us to desert those vain idols, and to recognise him and that he shared in the true God. 10. Although the Jews killed him according to the flesh, he plundered the lower world and rose on the third day by his divine nature, and established the law of incorruptibility and the resurrection of the dead." When the emperor heard these things he was filled with fury, and ordered their accusers to be conscripted into the army in their place, and said to them, "I am sending you to the dux Antiochus, you accursed men, because of the friendship and the trust which you enjoyed from me, and because you raised him to that rank; that you may realise from what honour you have fallen, and how little your discernment as a result of which you have to bear the ultimate punishment for the blasphemy which you dared to commit against the gods." When he had said these things he sent them to the dux Antiochus, and ordered them, their whole bodies bound with heavy chains, to be conducted to the regions of the East by the officials of the individual cities [along the route]. 11. Moreover he also wrote a letter as follows: "The emperor Maximianus, pious and victorious, sends his greetings to the dux Antiochus. The most great providence of the gods desires that no man, least of all the guardians of my empire, be impious and unacquainted with them, and accordingly I have judged deserving of the ultimate penalties Sergius and Bacchus who have been convicted by their own confession of the impious religion of the Christians. These, who did not think the questions of the imperial judges worthy [of reply], I have sent to your authority, so that if they repent and offer sacrifice before the gods, you will grant them pardon and send them back to me without tortures. For then they will receive back their military rank, better rank even than that which they held now beforehand. However if they are absolutely unwilling to do these things, but persist in their wickedness, do not delay in subjecting them to the severity of the law, and destroy their hopes of a long life. Farewell." The day itself being late they took them as far as the twelfth milestone from the city, and they remained in a stable under great supervision and guard. 12. About midnight an angel of the Lord came and said to them, "Have confidence and fight against the spirit of the devil, like most brave soldiers and athletes, in order that by your struggling you may cast him beneath your feet, and that when you come to see Christ, the king of glory, we may meet you with a multitudinous army of angels, singing the praise of your victory, bearing to you the palms of your perfect faith and the crowns of your confession." Thus when it was dawn, rejoicing with every gladness, they began walking along the road. There were with them certain of their servants who, because of their love of Christian piety and their care for the physical well-being of their masters, were unwilling to leave them in such need. They heard about the visit of the angel which [their masters] saw that night and repeated the story to each other in turn. As they walked they both sang psalms together, and prayed as in with one voice, saying, "We have been attracted along a journey of witness to you, and we shall be occupied upon your commands as if upon every treasure, and we have meditated upon your ways. We shall reflect upon your righteousness, Christ, grant your servants that we may live and preserve [your teachings]" [Psalm 118:14, 17]. 13. 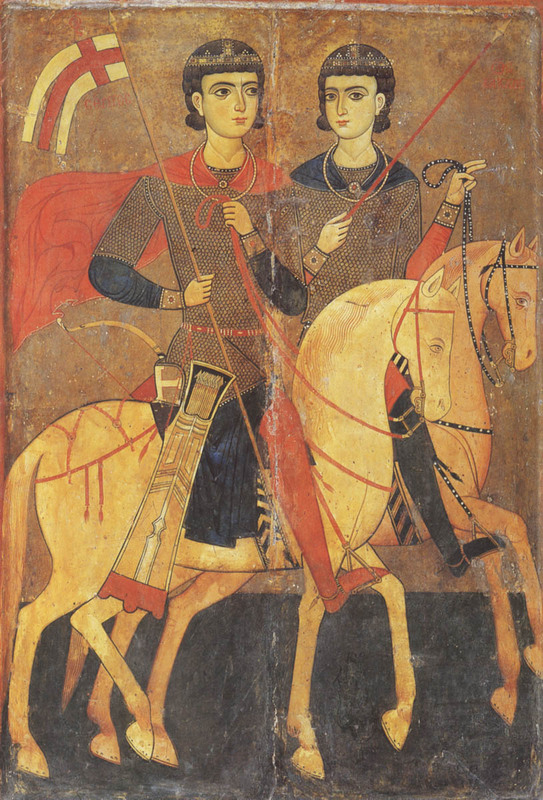 Thus, in accordance with the emperor's command, the soldiers of Christ were dispatched with every guard through all the cities, in consequence of the life of the martyr which had been laid before them, until they were brought to the province of Augusto-Euphratensis, to soldiers in a fort by the name of Barbalissus which borders the tribe of the Saracens, in which fort Antiochus held his seat. They surrendered them to him, along with the emperor's letter, about the ninth hour. Antiochus rose from his seat, and in his purple cloak accepted the emperor's letter which he read silently to himself. He called his staff commentariensis and said to him, "Take these men who have been sent here and place them in military custody, without the usual ill-treatment. Set their feet in stocks; but on the following day bring them to court that I may hear them in accordance with the laws." The commentariensis, just as he was instructed, took them and set them in stocks. 14. Late that night they sang psalms together, and prayed as if with one voice, both saying, "O Lord, you who crushed the heads of the great serpent, who have dried rivers, caused springs and floods to burst forth, you who have made the ends of the earth; look down upon us, Lord Our God, since the enemy has abused us on account of your name. Do not surrender the lives of men who trust in you to these men who are more savage than wild beasts even. Do not leave neglected to their end the lives of wretched men. Remember your covenant, for the lands have been filled and darkened with houses of wickedness. Let us not return in shame, wretched and distressed, to praise your name [Psalm 123: 13-21]. 15. Do not neglect the voices of those who beseech you, since the pride of those who hate you always rises to your notice; men hate us for no reason, but you, O Lord, help us and free us for your name's sake." When the saints said these things they fell silent, and an angel of the Lord came and said to them, "Have confidence and remain steadfast in your faith and confession, since Our Lord Jesus Christ is with you." They rose from their sleep and told to their servants the angel's revelation, and took confidence. Moreover they began to sing psalms as follows, "We cried out to the Lord when we were troubled, and he heard us from his holy mountain. We laid down and slept, and rose again since the Lord guarded us. We will not fear the thousands of people who besiege us. Rise, Lord, save us, Our God, since you are our salvation, and hoping in you also we give you praise" [Psalm 119:1, 3:6-7]. 16. When morning came the dux took his seat in the praetorium, called the commentariensis and said to him, "Let the prisoners enter". The commentariensis replied, "They are present in your might's court." He read the emperor's letter to the saints as they stood there. When this had been done the dux Antiochus, having been induced by his counsellor to soften somewhat, said, "You should have always fulfilled the emperor's commands and sacrificed to the gods, in order to have his gratitude; since, for what reason I do not know, you were absolutely unwilling to do this, and have fallen from such glory, sacrifice to the gods now, knowing that if you do this you will have greater honour and glory among men than previously, and you will receive back your military rank with its trappings multiplied. For your emperor, humane by nature, has promised you that if you repent of your previous actions and sacrifice to the gods, all these things will be restored to you. Mindful of your friendship and of the favours which I had from you especially, my lord Sergius, I advise you to do this. But if you absolutely refuse to do this I must carry out to their strict letter the commands of the emperor." 17. In response to this the saints said, "We have left everything and followed Christ in order to serve among the angels, despising earthly military service, and to possess the heavenly treasures, tossing aside the earth's wealth. For what would it profit us if we gain the world but lose our souls ? So do not give us such advice, Antiochus; your tongue speaks deceit, and your lips con- ceal the venom of a viper. But your talk which urges us to perdition does not touch our souls. Do what you will; for we do not worship wood and stone, but Christ, the Son of God, the eternal king, to whom bends every knee of heaven, earth and the underworld; and every tongue confesses to him. For your gods are not gods but man-made idols. For if they were gods they would make men sacrifice to them, and would not rely on human foresight to be avenged upon those who are unwilling to adore them and offer them sacrifice." 18. The dux, Antiochus, replied, "We do not avenge the gods; but through their foresight our enemies' every strength is subjected to us; but we accuse you because your's is an unholy and impure worship." But the holy martyrs responded and said to him, "You are the impure and unholy, and those who fol- low you and sacrifice to demons and adore wooden objects which are hurled into the fire a little while afterwards." Then, greatly angered, the dux Antiochus ordered that blessed Sergius be taken back into custody again, but that blessed Bacchus be stretched out and beaten with heavy clubs until those that were beating him fell exhausted upon the ground. But when these were tired out by their work he ordered others to ?????? the holy martyr and beat his stomach again, and he himself said, "Let us see if Christ can help, he whom you call God." When the saint's body had been beaten for a long time, and blood was flowing all about, the martyr Bacchus said to Antiochus, "Satan's servants have wearied of their beating, your wickededness has failed. The tyrant Maximianus has been defeated, and so has your father the devil. To the extent that that which is external, my body, is destroyed, the being within is renewed for future life." 19. As he said this a voice descended from heaven, saying, "Come now to the kingdom which has been prepared for you, my athlete Bacchus." Hearing this voice those who stood about were amazed and struck speechless, and when the saint was being killed he surrendered his soul into the hands of angels. In his anger Antiochus ordered that his body was not be buried, but was to be thrown out for the dogs, wild-animals and birds. When his body was thrown out a long way from the camp there gathered a crowd of beasts who surrounded it; but birds hovering above did not permit the cruel beasts to touch it. And they continued guarding him until night-time. When it was evening some of the brothers who lived in caves there came down and took the body. They were allowed to do by the animals, as if by intelligent human-beings, and they buried him in one of their caves. 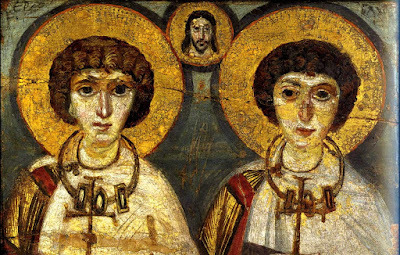 But blessed Sergius, who was greatly saddened and distressed, was left alone and cried as he wept, "Alas for me, my brother and messmate Bacchus, never will we sing together saying, "How good and pleasant it is for brothers to live together." Ascending into heaven you have been separated from me, and I have been left alone upon the earth." 20. When he had said these things there appeared to him that same night blessed Bacchus, dressed in military garb with his face shining like that of an angel, and he said to him, "Why are you sad and distressed, brother ? Even though I am not physically present with you, I am with you in the chain of faith, singing and saying, "I hastened along the way of your commands when you broadened my heart." So hurry to reach me, brother, by a good and whole con- fession, guarding your faith and achieving your end. For righteousness and a crown have been laid aside for you with me." Therefore, rising at dawn, he described to those who were with him the garb in which he had seen blessed Bachus that night. 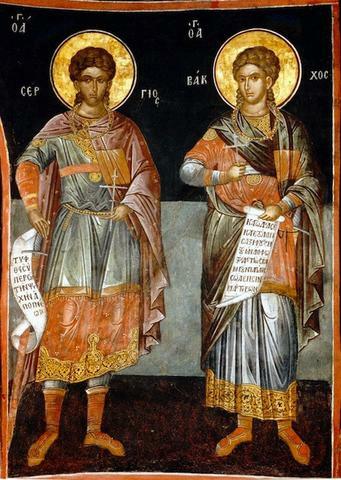 In this way the dux, being about to leave Barbarissus for Sura, ordered that blessed Sergius follow him also, and besought him to offer sacrifice. But rejecting his enticements he made his journey in silence. 21. When they reached Sura Antiochus took his seat in front of the tribunal in the praetorium, called blessed Sergius to him and said, "The most impious Bacchus, unwilling to obey and offer sacrifice to the gods, chose to be deprived of his life, and got the death he deserved. But you, my lord Sergius, why have you surrendered yourself to such great misery by following this seductive and wicked religion ? I respect you, remembering your favours, and I thank you that you provided me with this command. And now you are the accused, questioned in detail, but I sit on the judge's bench." But Christ's martyr Sergius said in response, "This affliction and temporary disturbance earn for me great trust and eternal glory in the house of the king of heaven and earth and every soul, Jesus Christ the Son of God. Would that you would hear me now also, and recognise God and my king Christ, and take thought for yourself, that eternal office and immortal glory might be presented to you, for just as it is with the earthly and mortal emperor, so also it is with Christ the heavenly and eternal king. 22. For the leaders of the earth fall swiftly, as the psalmist said, "Just as men you will die, so also each of you princes will fall." And again, "I saw a wicked man exalted and raised as high as the cedars of Lebanon. I sought him, and his place was not found." The dux Antiochus said, "Leave behind this empty and disordered nonsense and sacrifice to the gods, and be obedient to the wor- thy commands of our emperor Maximianus. But if you are unwilling to sacrifice, know that you are forcing me to forget everything which you gave to me, and to subject you to most severe legal penalties." Thereupon blessed Sergius said, "Do what you will; for I have Christ helping me, he who said, "Do not fear those who kill the body; for they are not able to kill the soul. Rather fear him who is able to delver to perdition in hell body and soul. Thus my body is subject to you; punish and afflict it as much as you want, in the knowledge that even if you destroy my body, you cannot have power over my soul, neither you nor your father Satan." 23. Angered by this the dux said, "It seems that my humaneness has made you bolder and more insolent." Thus he called his adjutant and said, "Dress him quickly in boots pierced with nails, with the nails left upright." When he was so dressed Antiochus, sitting in his carriage, ordered him to run before him, instructing that the horses be driven swiftly as far as the fort Tetrapyrgia. This fort is nine miles distant from Syrus. As he ran he prayed the psalms, saying, "I have awaited the Lord in expectation, and he has looked down upon me and led me forth from the lake of pagan misery and the mud of filthy idolatry, and has set my feet upon the rock of confession." When they reached the fort of Tetrapyrgia the dux Antiochus said, "I am amazed at you, Sergius, that having being interrogated in so great a court you have been able now to endure such great punishments." But the holy martyr of Christ said in response, "Your punishments are not bitter to me, but sweeeter than honey from the comb." Descending from his carriage the dux entered the praetorium, order- ing that the martyr of Christ be placed in military custody. 24. When it was evening blessed Sergius began to sing, saying, "Those who used to eat my bread at one time have increased their trampling upon me, and by the cords of their most severe penalties have laid a snare for my feet, wishing to trip me up. But rise, Lord, obstruct and overthrow them, and free my soul from the wicked." Around midnight an angel of the Lord came and restored his feet to health for him. Thus when it was dawn, sitting before the tribunal, the dux ordered that he be led forth, thinking that he would not be able to come as a result of the pain, except perhaps if he were carried. When he was being led forward the dux, seeing from a distance that he was walking, and that he had no limp at all, was terrified and said, " This man is a magician; it was in this way that he had such great influence over the emperor, acquiring it by his magic skills, and the things witnessed here are evidence of those allegations. I thought that he would not have been at all able to walk on his feet seeing that they had been made useless for this as a result of yesterday's punishment. I am amazed, by the gods, at how he now approaches as if he had suffered nothing." 25. Thus, when blessed Sergius stood before the tribunal, Antiochus said, "Wretch, think about it for the final time once more, and sacrifice to the gods and save yourself from the forthcoming punishments. For I spare you because I am mindful of your favours. But if you do not offer sacrifice, know that your magic by which you thought you could be saved will avail you nothing." But blessed Sergius said in reply, "Would that you would recover your senses from the drunkenness of demonic error ! For I am sober in the Lord, he who ground the arms of your father the devil beneath the feet of his humble servant, who has granted me victory against you, who has sent his angel to me and healed me. But you are the real magician, you and those who worship demons. For the unspeakable worship of demons is the mother of all impiety. That is the beginning, cause and end of every evil." Further exasperated Antiochus took his seat again in the carriage, and ordered him, wearing the same boots, to run before him as far as the fort of Resapha, nine-miles dis- tant from Tetrapyrgia. 26. When they had reached the fort of Resapha, the dux Antiochus said to blessed Sergius, "Most wretched one, has the punishment of the nails chased away your urge for foolishness, that you may at last submit to to sacrifice to the gods, or do you persist in that urge which has preoccupied you ?" The most brave martyr of Christ said in response, "Let it be known to you, Antiochus, that it is through this folly that I continue to destroy your strength and that of your father the devil. Do what you want, so; for I do not worship demons, nor offer sacrifice to idols, but I hurry to offer the unstained sacrifice of myself to my Lord God." Thus Antiochus, seeing that he was persisting fixed and unmoveable in his faith and confession of Christ, passed the following sentence against him, "Sergius, who has shown himself unworthy of the piety of the gods, who has joined himself to the most impious sect of those who are called Christians, and has offended against the great fortune of the emperor Maximianus, in that he was unwilling to be obedient to his venerable edicts to sacrifice to the gods, this man the laws command to be put to the sword." Thereupon some of those present hailed as just the penalty which had been passed against him. Thus the deputies came, gagged him, and led him from their midst to a remote spot in order to perish by the sword. 27. Then a great crowd of men and women followed him in order to see the death of the blessed martyr. When they saw the freshness of his face and his great youth they wept most bitterly, sighing over him. Even the beasts of that region, leaving their dens, all gathered together. Attacking no-one, and touched by their cries, they reflected upon the death of the holy martyr. When they were drawing near to the place in which the martyr of Christ, Sergius, was about to be killed, he asked the guards to provide him with a little time to pray. Stretching out his hands to heaven he said, "The beasts of the field and the birds of the sky, recognising your lordship and rule, have gathered for the glory of your holy name, that by their confession they might turn the mind of intelligent men to you, you who by the nod of your goodness and will desire that all men be saved and come to a knowledge of the truth. Suspending their death, and awaiting their repentance, heed not, Lord, their sinful ignorance which they directed against me on account of your name. 28. Enlighten the eyes of their hearts and lead them to recognition of you. Finally, take my soul and lay it to rest in your heavenly tents with those of this age who have pleased you. For I entrust my soul to you, since you have rescued me from the snare of the devil." Thereupon, when he had said these things, he made the sign of the cross, and knelt down. He was beheaded and surrendered his soul to the angels. Moreover a voice was heard from heaven, saying, "Sergius, my soldier and athlete, enter into the kingdom which has been prepared for you. For the ranks of angels, the numerous patriarchs, the unions of Apostles and prophets, and the spirits of the just await you that you might learn with them the good things which have been prepared for you." Moreover the place in which the life of the holy martyr was taken was split and formed a great abyss, God so arranging, so that those who wallow in filth like pigs would not dare, because of their fear of the abyss, to draw near and trample upon the blood of the holy martyr in that very place. For this reason was that great void created, and that place has remained so right until the present day, preserving signs of the will of God of old, that a firm foundation for faith may be laid in [the hearts of] those who do not believe by the existence of this special miracle. 29. 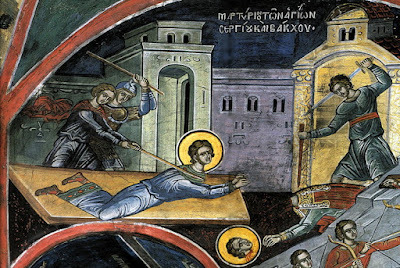 Thereafter some of those who had gathered to see the death of the holy martyr, noticing the natural safety of the place, gathered up his corpse, and covering it as best they could, laid him to rest in the same place in which he had also suffered. 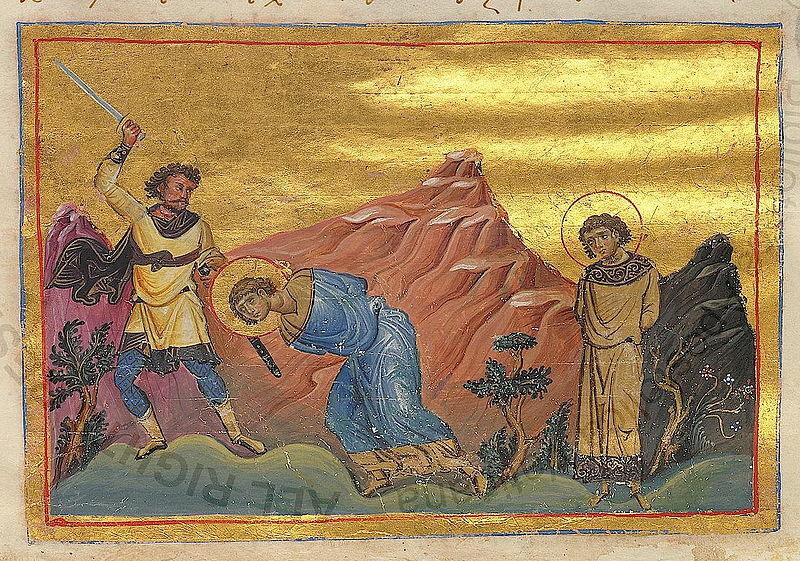 Thus a long time afterwards some religious men, coming from the fort of Syra and fired by a zeal for Christ, began to remove him from his place like some most precious treasure. But saint Sergius did not permit his body to be secretly removed, the body which had suffered punishment publicly, but besought God to rouse a fire in that same place, not to be avenged upon those who were trying to steal his corpse, nor to burn them, but to light up the darkness of the night and signal this theft to the fort of Resapha. Thus, when a fire had been roused in the place where the body lay, some of the inhabitants of the camp saw the flame reaching to the heavens, thought that the very great fire had been caused by some enemies, and sallied forth armed. 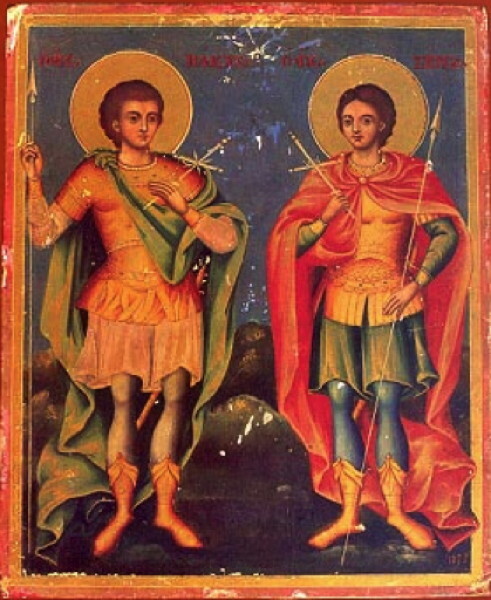 They pursued those who tried to steal the corpse of the holy martyr; but in response to the requests of the thieves they allowed them to stay there for a few days; these, making a building from stone and clay in the place where the body lay, and covering it over in honour of the martyr, departed thus. 30. The worship of our Lord and Saviour Jesus Christ gradually prospered, and 15 most holy bishops, gathering as one, built beside Resapha a cemetery worthy of his confession. They translated to there the body of the holy martyr, and deposited it in its martyrion on the same day that he had suffered, 7 October. Many saving-works and miracles are performed wherever his holy relics have been, especially at his grave where he had previously lain. The holy martyr beseeches God as an endowment of the place where he suffered that all who flock there should be cured of their differing ailments. He cures those who are possessed by unclean spirits; and the wild beasts are tamed also. For the beasts preserve the day on which he suffered as an annual holiday, and gathering from the wild which is all about and mingling with men, none at all attack, nor do they rush to the harm of the other gathering animals. Rather, honouring the martyr of Christ, they persist in gentleness at that place in accordance with the command of the Lord, whose is the honour and glory forever and ever. Amen. In contest you were victorious warriors of the Trinity, and an illustrious pair of martyrs, Sergius godly champion, and Bacchus noble athlete. In the radiancy of your glory you shelter those who cry: Glory to Him Who has strengthened you; glory to Him Who has crowned you; glory to Him Who through you works healings for all. Let us gather and crown with praises, the noble martyrs and brothers in the faith, Sergius the warrior of the Trinity, and Bacchus who with him in tortures persevered in praising Christ, the Prizegiver and Creator of all.